Sony Liverpool prepares for the next-generation of hover-racing. June 28, 2006 - UK games employment firm, Datascope Recruitment, revealed some interesting information this morning when it posted a new "Help Wanted" ad on behalf of Sony Computer Entertainment Europe. The ad, marked "Urgent", was in search of new senior/ lead designer for the SCE Studios Cambridge Team and more specifically, a new WipEout project for the PlayStation 3 and PlayStation Portable videogame systems. Other positions are also available. This classified is the first time that Sony has allowed any public mention of a PlayStation 3 WipEout title, but no other information about the game has been divulged. American Sony representatives had no official comment on the European job posting, despite the fact that Datascope is the official staffing firm for SCEE. For the unfamiliar, WipEout is a popular first-party franchise that has seen release on every PlayStation gaming platform thus far. The most recent version, WipEout Pure, shipped as a launch title for the PSP's debut in March of 2005 and went on to win several IGN PSP awards -- including "Best Racing Game" and "Best Downloadable Content," as well as runner-up nods in "Best Graphics Technology, Best Artistic Design," and "PSP Game of the Year." 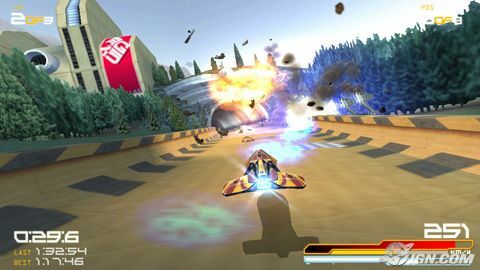 Clemens Wangerin, director of the London studio of Sony Computer Entertainment Europe, confirmed at the time of a maintenance granted to the magazine develop the development of two new episodes of WipEout, one on PlayStation 3 and the other on PlayStation Portable. In spite of the little of information available, WipEout PS3 should profit from a gameplay adapted to the Sixaxis lever in more than one mode of play on line and downloadable elements. Developer admits it's coming and will support SIXAXIS. UK, February 2, 2007 - A key developer at Sony's Liverpool studio has officially confirmed that WipEout on PS3 is in development and that the game will use the SIXAXIS controller. Speaking to Develop magazine in the UK, Clemens Wangerin, internal development director at the studio, said the WipEout team is working on a PS3 version, stating the new game has "SIXAXIS controls, maybe online multiplayer and downloadable content". Rumours of a PS3 incarnation of Sony's classic sci-fi racer have been circulating for a few months but this is the first hard evidence that the game is actually in development. When questioned over details of a new WipEout game a Sony spokespersion simply said, "We'll be making a full announcement about WipeOut on the PS3 at some point in the future". Will it be tomorrow? Next week? Who knows, but you can be sure we'll bring the news first.